Professor Beattie joined the Capital University law faculty in 2001. He previously taught philosophy at Tulane University and Xavier University in New Orleans. Upon graduation from Vanderbilt University Law School where he was senior articles editor for the Vanderbilt Law Review. 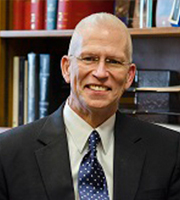 Professor Beattie served as a judicial clerk for Chief Judge Gerald Bard Tjoflat of the United States Court of Appeals for the Eleventh Circuit. He then became a litigation associate, a practice highlighted by arguing before the United States Supreme Court, at Greenberg Traurig, P.A. in Miami and with Simpson, Thacher & Bartlett in New York. Winner of the 2002 Teacher of the Year Award from the Association of American Law Schools (AALS), Professor Beattie teaches Constitutional Law, seminars in Law and Religion, Ideas of the First Amendment, Modern Legal Philosophy, and Jurisprudence. He is the faculty advisor to the Capital University Law Review. Professor Beattie’s publications include: On Philosophy in American Law, American Journal of Legal History, Beyond Separation and Neutrality: “Non ‘Market Participant’” as the Central Metaphor for Religion Clause Jurisprudence, Washington University Jurisprudence Review, Re-Conceptualizing the Debate between Evolution and Intelligent Design: From the Micro and Macro to the Metaphysical, Fortress Press, Taking Liberalism and Religious Liberty Seriously: Shifting Our Notion of Tolerance from Locke to Mill, Catholic Lawyer, Socratic Ignorance: Once More into the Cave, West Virginia Law Review, Religion and Public Schools: Current Controversies, and Privacy in the First Amendment: Private Facts and the Zone of Deliberation, Vanderbilt Law Review. From 2014 to 2017, Professor Beattie served as Associate Dean for Academic Affairs, a position in which he was responsible for leading the academic programs within the Law School as well as for the day-to-day implementation of academic policies adopted by the Law Council and Faculty.